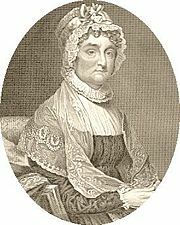 Abigail Smith Adams (November 11, 1744– October 28, 1818) was the wife of the second President of the United States, John Adams and is seen as the second First Lady of the United States, though that term was not coined until after her death. A woman of exceptional ability and acute political skill, she was an invaluable support to her husband throughout his political career. Indeed, as a couple the Adams's are an excellent example of the value of husband-wife partnership in public life. Moreover, Abigail Adams advocated and modeled an expanded role for women in public affairs during the formative days of the United States. She helped plant the seeds that would start women and men thinking about women's rights and roles in a country that had been founded on the ideals of equality and independence. Abigail was born as Abigail Smith on November 11, 1744, in Weymouth, Massachusetts, to the Rev. William Smith and Elizabeth Quincy. Abigail was raised simply and without pretension, though her relatives, especially on her mother's side, were among the leading families of their time. Her mother's relatives were descended from the Quincy's, a family of great prestige in the Massachusetts colony; her father and other fore bearers were Congregational ministers, leaders in a society that held its clergy in high esteem. Like most girls of her time, Abigail received no formal education. Girls were taught reading and writing primarily so that they could read their Bible and write letters. They also learned basic arithmetic to help prepare them for their role as housewives, when they would be required to balance budgets and settle accounts. Although some Massachusetts towns did have primary schools for girls, called "dame schools," most families took responsibility for the education of their daughters at home. The Smith girls were fortunate to have a father who loved learning and reading and who encouraged his children to share in this passion. To help with their education, William Smith gave his daughters and son full access to his extensive library of excellent books. Abigail shared her father's love of books and read widely in poetry, drama, history, theology, and political theory. As she grew older, Abigail became increasingly determined to educate herself, and by the time she was an adult, she had become one of the best-read women of her time. Abigail Smith married John Adams in 1764. The young couple lived on John's small farm in Braintree (a small Massachusetts town), which later was renamed Quincy. Later when John's law practice began to flourish they moved to Boston. In ten years they had six children: Abigail Amelia ("Nabby"), future President John Quincy Adams, Susanna Boylston, Charles, Thomas Boylston, and a daughter named Elizabeth who was stillborn. They had a strong love that grew and provided a sturdy bond for their relationship. Abigail thought of John as her best friend, and as an old woman, she still remembered the thrill she felt the first time he held her hand. To John, the relationship was equally satisfying and important; as he carved out his successful career, he relied heavily on Abigail's advice, support, and companionship. John was proud of Abigail's abilities to manage a farm and raise a family without him during his long absences on the nation's business. He told her she was so successful in budgeting, planting, managing staff, regulating live-stock, buying provisions, nursing and educating their children, that he knew she could handle their affairs in his absence. Often, Abigail spoke up for married women's property rights and more opportunities for women, particularly in education. She believed that women should not submit to laws clearly not made in their interest. Women should not content themselves with the role of being decorous companions to their husbands. They should educate themselves and be recognized for their intellectual capabilities, for their ability to shoulder responsibilities of managing household, family, and financial affairs, and for their capacity morally to guide and influence the lives of their children and husbands. During the Revolution, Abigail wrote many letters that she is now famous for. Her letters talked about current politics and expressed her opinions. When John was serving in the Continental Congress, Abigail wrote him a letter, telling him to "remember the ladies" when making the nation's new laws. Though Abigail really tried to give women more rights, the American Revolution did not do very much in that respect. The new state bills said that all the people were equal, but only white males had the full privileges of citizenship. It was clear in the letters that Abigail wrote that she was a Federalist. Her letters and writings are remembered as some of the best of her time. Of the four years her husband served as President, Abigail Adams was actually present in the temporary capital of Philadelphia and then, finally, the permanent "Federal City," of Washington, D.C. for a total of only eighteen months. She nonetheless made a strong impression on the press and public. She was unofficially titled "Lady Adams," and encouraged such recognition by assuming a visible ceremonial role. Often mentioned in the press, her opinions were even quoted at a New England town hall meeting. A highly partisan Federalist, Mrs. Adams helped forward the interests of the Administration by writing editorial letters to family and acquaintances, encouraging the publication of the information and viewpoint presented in them. She was sarcastically attacked in the opposition press, her influence over presidential appointments questioned and there were printed suggestions that she was too aged to understand questions of the day. One anti-Federalist derided her as "Mrs. President" for her partisanship. Indeed, Abigail Adams supported the sentiment behind her husband's Alien and Sedition Acts as a legal means of imprisoning those who criticized the President in public print. Fearful of French revolutionary influence on the fledgling United States, she was unsuccessful in her urging the President to declare war with France. She remained an adamant advocate of equal public education for women and emancipation of African-American slaves. 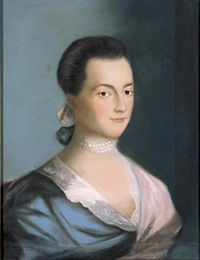 Highly conscious of her role as the president's wife, Abigail Adams saw her role largely as a hostess for the public and partisan symbol of the Federalist Party. Her entertainments were confined to a relatively small home in Philadelphia, turned into a hotel after the capital was moved from Philadelphia to Washington, D.C. She also attempted to influence fashion, believing that the more revealing Napoleonic-style clothing then popular were too indecorous. Since presidential families were responsible for covering the costs of their entertainments and the Adamses were enduring financial difficulties at the time of his presidency, Abigail Adams's receptions were somewhat Spartan. The first First Lady to live in the White House, she resided there for four months, arriving in November 1800. During that time she famously hung her family's laundry in the unfinished East Room to dry. In the election of 1800, Adams and his party suffered disastrous defeat. The Federalist Party never recovered. The couple returned to Quincy where they spent their remaining years. They lived peacefully together without the pressures and demands of political life or the necessity of any more long separations. Adams's last years, however, were not without hardship. Although she was near her family, her own chronic illness and the deaths of close relatives and friends, including her daughter, Nabby, to cancer, made life difficult. She died on October 28, 1818, after a brief illness. She is buried beside her husband in the United First Parish Church, Quincy (also known as the Church of the Presidents). Her last words were "Do not grieve, my friend, my dearest friend. I am ready to go. And John, it will not be long." A cairn now crowns the nearby hill from which she and her son John Quincy watched the Battle of Bunker Hill and burning of Charleston. An Adams Memorial is proposed in Washington, D.C., honoring Abigail, her husband, and other members of their family. The opinionated Mrs. Adams took every opportunity to speak on political issues, and forewarned her husband that if women were not involved in the administration they would one day rise up and overthrow the government. Wishing to be addressed as "Mrs. President Adams" her political life was compromised when her husband lost reelection in 1800. The Adams' would be the first family to take up residence at the White House. The home was not yet finished and with the absence of a roof over the East Room, Abigail found it a convenient place to hang the family laundry to dry. As a celebration of their marriage they granted two of their slaves freedom and paid for the education of one. John and Abigail were the first presidential couple to celebrate their golden wedding anniversary (50th anniversary) in 1814. Abigail Adams holds the distinction of being the first woman who was the wife of a president and mother to another, John Quincy Adams, sixth president. This page was last modified on 30 November 2012, at 00:51.